The famous by now hit, “Ice Ice Baby” is a hip hop song written by American rapper Vanilla Ice and DJ Earthquake. Here we will not hip-hop. We will focus on the ice. Ice. The essential part of every cocktail. It is the one item that can ruin a party. Every time I am making cocktails I buy fresh ice since the one left in the freezer can pick up smells like nothing in the world. Ice is water. Water gets along with many molecules. Some of them smell funky. So when the solid water gets in contact with these molecules even in the harsh freezer environment, it will immediately absorb them. In many cases, even the ice-cube trays can pick up smells. So before we endeavor in the ice making we need to know what is ice. Ice is the solid form of water. The difference between vapor or liquid phase and the solid phase is the orderly arrangement of the water molecules in a 3D structure. This structure starts with the arrangement of a few water molecules, in a formation called seed crystal, and the rest follow. The ice crystal grows towards all directions until all the molecules are in an arrangement. Of course, it is nearly impossible to get a single seed crystal so there are many seed crystals so you get a more random arrangement that is called polycrystalline. The faster the freezing, the more seed crystals you create. Why is this important? Because it make the difference of crystal clear ice vs opaque ice. Or at least it is on of the factors. It is also the same reason for grainy ice cream. Slow-cooled ice cream also creates a large ice crystals giving the grainy taste. Direct result of the ice making is the quality of the ice and the clarity of the crystals. Imagine that you having and a deck of cards. Now imagine that with a drill you are making a hole trough all the cards. In order to see through the hole on the deck, you need to arrange the cards nearly perfectly so all the holes are aligned. Similar is the case for the ice (or any other crystal for that matter). As you see in the image above the arrangement of the water molecules leaves some open voids from where light can diffuse. The better arrangement your crystal have the more light will go through. If you have a single crystal it will be clear as a diamond (which by the way is a perfect crystal). 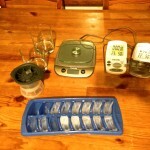 The faster you freeze the water, the more seed crystals you create, the less clear your ice is. Also, another factor that creates issues is impurities. The water contains a percentage of oxygen and air that is dissolved in it. When you freeze the water many of these impurities are trapped and make the ice look white. Clear ice vs white ice is not that important for the ice itself. It is just a visual effect. However, it is adding an flare of elegance to the drink. To get the ice to be clear Opaque are menu things you need to take into account. 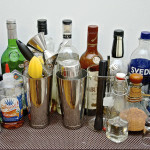 I have added a few links at the end of the post that will give more information to the adventurous drinker. Here, I have simplified the process and although it does not yield the perfectly clear ice, it does give some good quality cubes that are quite clear. You will see the process in detail in the next post. The idea is to keep the water at rolling boil for 10 minutes, and while it is still warm (between 60°C and 70°C) get into the trays or molds and then in the freezer. 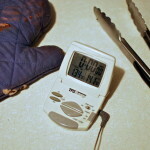 The warm water freezes slower, and also the boiling will help the dissolved gasses to evaporate. Making the ice is one aspect of the equation. Using it is the other. Using the ice in a drink either alcoholic or just a beverage has two effects. Dropping the temperature of the drink making it more fresh and certainly more enjoyable. Diluting the drink that in certain cases mellows it down and in other just making it blunt. Both cooling and diluting depends on a property that is called surface area. 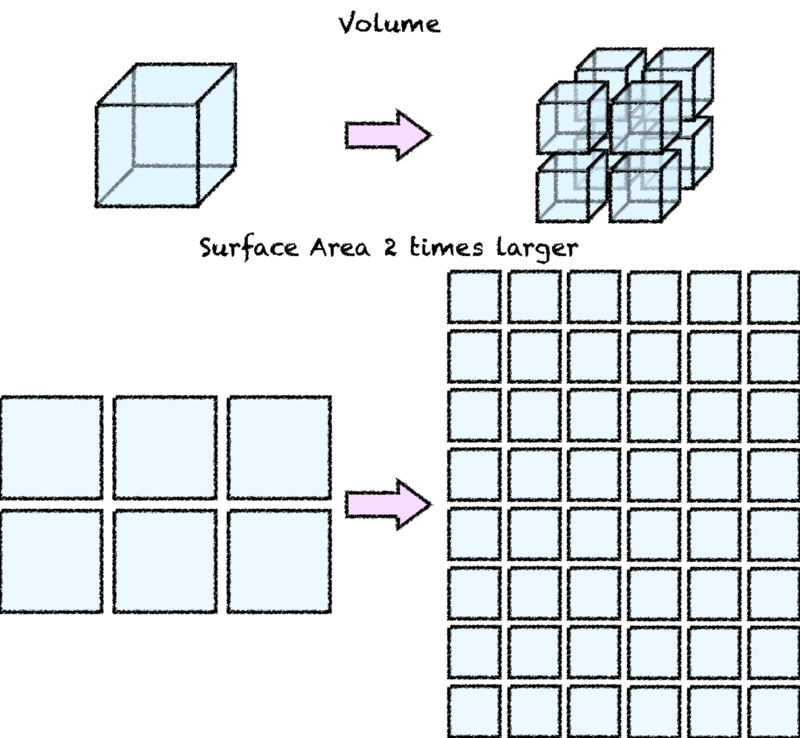 Surface area is the total exposed surface of an object. Heat is diffusing to or from an object through the surface. If you are working on a butter dough it is recommended to use your finger tips because the smaller surface area transfer less heat. Similar is the case for the dissolution of the ice or other solid object. If you look at a chocolate it will melt from the outside towards the inside. That’s why smaller chocolate pieces melt faster in the double boiler. The reason is simple. The same volume when you cut it into smaller pieces it acquires more surface area, but the total volume remains the same. This is illustrated in the following image. Fig. 2: The change in the surface area when you reduce the ice in smaller pieces. An ice-cube cut it smaller ice cubes that have half the size of the original ice-cube will yield 8 equal sized cubes. Although the total volume is the same, the surface area becomes 2 time larger! So using the same amount of ice in smaller pieces results in a much larger surface area, which in turn results in a higher heat transfer rate and higher melting rate. This concept is very important for picking ice, for reasons that will become apparent later on. 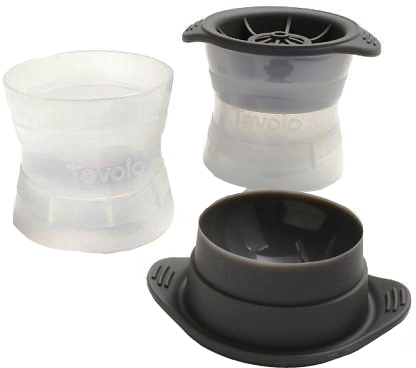 Also for the most effective cooling, we require a combination of two effects: the cooling with the heat transfer through the surface of the cubes and also through convection through the melting of the ice cubes and the mixing with the drink. A last concept someone needs to know before becoming an ice aficionado is the packing of the ice. If you get a pint glass and you add in there a couple of ping-pong balls the glass will be filled to the top, but there will be space left in-between the balls. If on the other hand, you had a mixture of different sized balls, you would be able to fit them a lot more efficient and there will be no space wasted. Again, the same goes with the ice. Uniform ice pieces can fill a glass, but they leave large space empty. This is ok in certain cases but not good in others. We will discuss this soon as well. Now that we know what we should look when we talk ice, let’s see what ice we can get. Currently, there are three major classes of ice cubes in the market. Ice-tray ice: Uniform shaped ice cubes formed in a tray or the ice maker of the hole refrigerator and are either in pellet or cubic like form. They are uniform in size and in their majority are large pieces. This as you realizes makes things harder if you want to use them to cool something quickly, like in a shaker. It is, however, an ideal way to keep cold a whiskey or any other straight liquor. Ice-bag Ice: There is the store bough ice that comes in a bag, and is produced by the crushing of a large block of ice. This results in, ice that comes in different sizes and is ideal to pack in a glass. 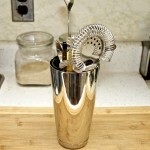 It is perfect to use it to shake a cocktail, or to serve mixed drinks on. The high surface area will result in a higher cooling rate and faster melting that will bright the various components together. Ice-mold Ice: This is a brand new type of ice that is actually a very large pieces of ice that was molded in a particular format, most commonly a sphere. The idea behind the ice mold is to create a spherical piece of ice that will cool the drink, but not dilute it down as much. 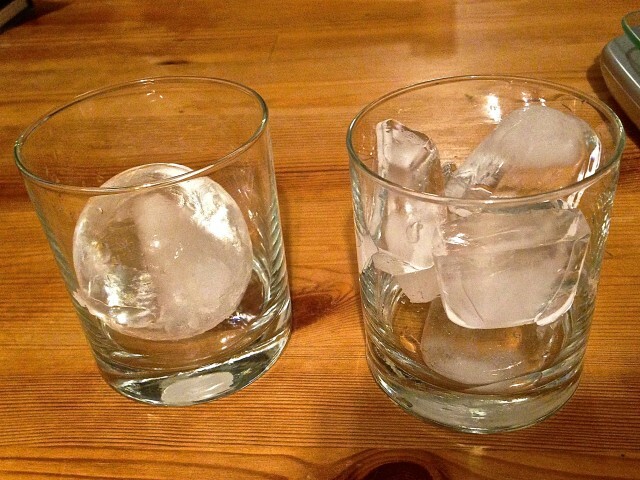 Whiskey Rocks: Those are not really ice. They are either pieces of stone or plastic containers with a liquid similar to the ice packs used in the portable coolers. You cool them in the freezer and you use them for cooling your whiskey or drink with out diluting. So, you see that the factor is smaller for the sphere which means that the surface area of the sphere is smaller as well. In plain english, it is the structure that will help pack as much ice as possible without creating much surface. In that front, you cannot do any better. However, although it does have less surface, that indeed can result in less melting wouldn’t you expect that the cooling would be also less efficient?